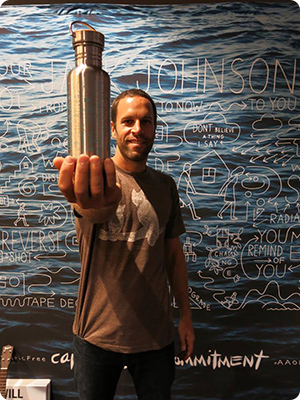 CHICO, CA – Jack Johnson has partnered with Klean Kanteen, a leader in providing sustainable solutions to single-use plastic, on his From Here to Now to You Tour and beyond, in an effort to raise awareness and support plastic free initiatives. "At Klean Kanteen, we love it when we see people refuse single use, and we really love it when people share this message to a bigger circle," says Erika Bruhn, director of marketing & brand at Klean Kanteen. “We are honored to see Jack Johnson choose Klean Kanteen for his From Here to Now to You Tour. By providing water stations and reusable solutions for the band and crew, selling custom Klean Kanteen bottles and offering water stations to fans at most venues, they are certainly doing their part." Over the past few years, Klean Kanteen has directed considerable attention to providing events of all sizes with sustainable solutions to become more environmentally responsible. By providing a single event with water filtration stations and reusable options, Klean Kanteen has displaced upwards of 60,000 single–use plastic cups in one day. Through Jack Johnson's All At Once Community and social action network, fans are encouraged to connect with partner non-profits and take environmental action in support of sustainable local food systems and plastic free initiatives. As part of this tour the Johnson Ohana Charitable Foundation is offering direct and matching donations to All At Once plastic free partners including organizations such as 5 Gyres and the Algalita Marine Research Institute, which are raising awareness about the issue through research and education. “We are looking to support non-profits and partner with businesses such as Klean Kanteen, that are focused on solutions and alternatives to single-use plastic," says Jack Johnson. “We are taking measures on tour to eliminate plastic water bottles backstage and encouraging our fans to make a habit of using reusable water bottles." Because of this shared mission, Johnson and Klean Kanteen have decided to partner beyond his tour. Fans are encouraged to show support for plastic free initiatives and make a personal commitment through the All At Once Capture Your Commitment campaign. Fans can also purchase tour gift-sets through the official Jack Johnson online store, including one-of-a-kind reusable tote bags made from Johnson's old concert tees and an exclusive Klean Kanteen water bottle with artwork from Johnson's latest album release, From Here To Now To You. Profits from sale of the Jack Johnson-branded Klean Kanteen reusable bottles will benefit plastic free non-profit partners working in communities around the world. Jack Johnson grew up surfing and playing guitar on the North Shore of Oahu. He released his first album Brushfire Fairytales in 2001 and since has released 6 studio albums and 2 live albums that have sold over 20 million copies worldwide. With his success, Johnson has always tried to take the spotlight and shine it on issues important to him. In 2003, Jack Johnson released On and On and, with his wife Kim, founded the Kokua Hawaii Foundation and Kokua Festival to support environmental education in Hawaii's schools and communities. Johnson, his Brushfire Records label, and his touring crew have been leaders in the greening of the music industry in all areas of tour production and album packaging. In 2004, Johnson became the 50th member of 1% For The Planet and Johnson's 2005 release of In Between Dreams became the first album to carry the 1% label. In 2008, Johnson released Sleep Through the Static, recorded in his solar-powered studio, and donated 100% of his tour profits to the Johnson Ohana Charitable Foundation, an endowment founded by Jack and Kim Johnson to support environmental, art and music education worldwide. In 2010 Johnson released To The Sea, and travelled the world donating 100% of his tour profits to charity once again. In September 2013 Johnson released his 6th studio album, From Here To Now To You, which debuted at #1 on the Billboard Charts, and embarked on an international tour of Europe and North America whose profits will support plastic free initiatives and sustainable local food through Johnson's All At Once network. The total of these tour profit donations, along with Johnson's personal charitable activities, have resulted in over $25 million donated to charity since 2001.